I stand beside Brother Rush! 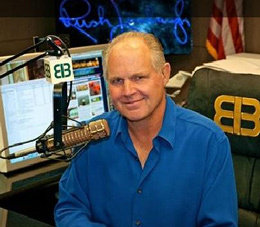 Showing himself to be a class act, Rush Limbaugh apologized to Ms Fluke. Rush further explained that his apology was not the result of losing sponsors. Rush said he turns down millions of dollars in sponsors each years. Rush said he apologized because he realized he had taken his sarcasm, to prove a point, a bit too far. Folks, when I was a little boy, I said I wanted to grow up to be a man. What was my image of a man? My dad and Sheriff Andy Taylor of Mayberry. Both men seemed to always try to do the right thing regardless of the consequences or people's opinions. It frustrates me that whenever a conservative says the wrong thing or makes a mistake, conservatives run for the tall grass to distance themselves from our colleague caught in the media's crosshairs. Well, I "ain't" doing that! Unapologetic, I love brother Rush! I am not going to waste your time, stating the obvious about the media's hypocrisy regarding defending women. We all know they never defend conservative women, when viciously attacked. I thought, "Oh my gosh, what if the left finally succeeded in getting the FCC to kick Rush off of the air? What would we do?" But then a truth I have learned over the years, gave me peace. As much as I appreciate Rush's efforts and extremely powerful influence in our tea party movement, no man is our source. God is our source. Sadly, we lost brother Andrew. King Obama has decreed, bring me the head of Rush Limbaugh. Obama and his mainstream media machine's evil efforts will fail. Cause last time I checked, God is still in control. Hang in there patriots, we're gonna win!